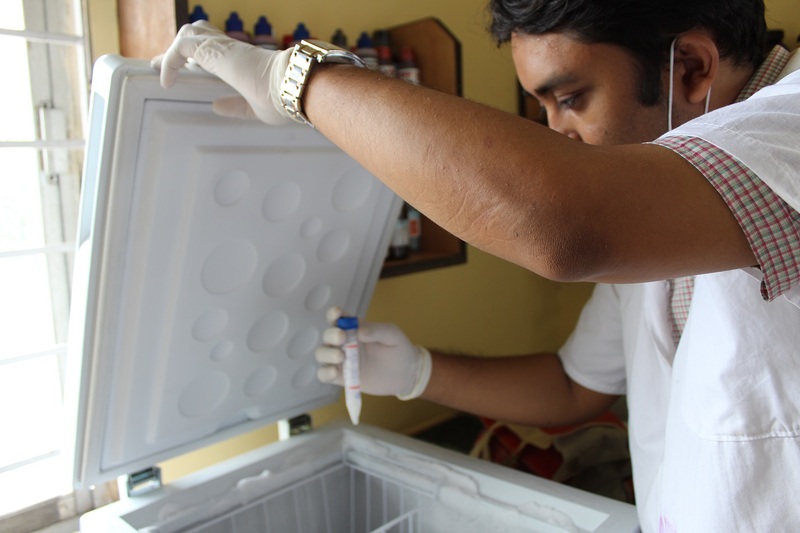 This departments deals with diagnosing pathological specimens surgically removed from patients. The ulcers , lumps and red and white lesions of the oral cavity removed from the patients need to be evaluated for presence of cancer , describing type of tumor and spread and grading of the lesion. 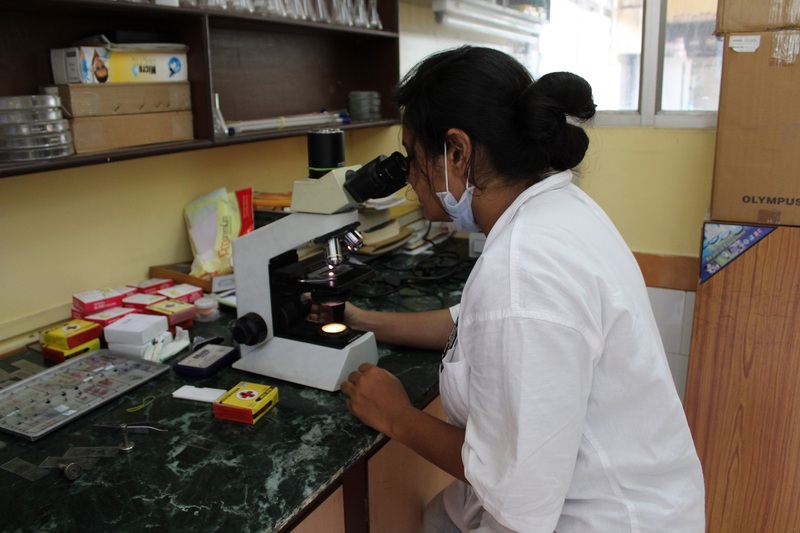 This department use microscopic and immunohistochemistry evaluation to prepare and diagnose the specimens provided to them and formulate a biopsy report. Apart from this the department individually performs some modern diagnostic tests like brush biopsy for oral cancer screening. This department works in close association with department of oral surgery for diagnosing and spearheading a community oral cancer diagnosis and screening program. Microscopic Slide Evaluation of Various Red / White Lesions of Oral Cavity , Microscopic evaluation of Various Tumors of Maxillofacial Region , Immunohistochemistry , Fine Needle Aspiration Cytology , Brush Biopsy. 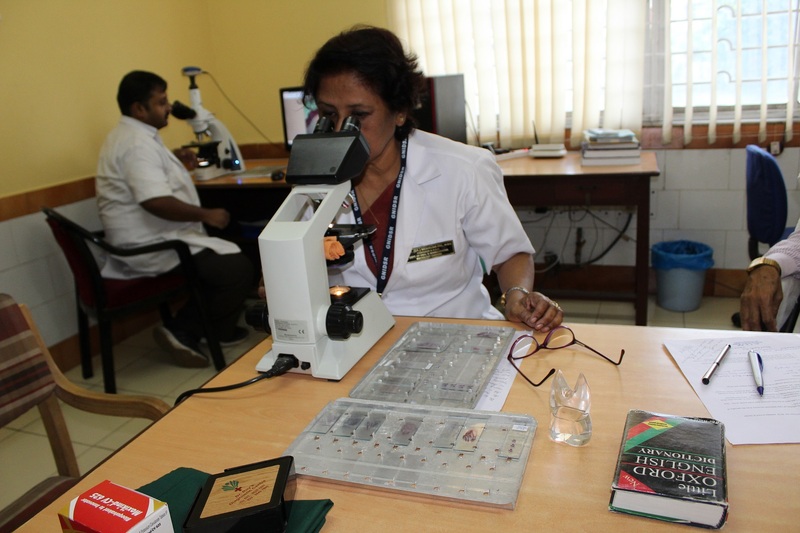 DR NEHA SHAH – Participation in TCC programme, Mumbai in July, 2019. 1. Anura A1, Das D2, Pal M3, Paul RR3, Das S4, Chatterjee J ,2017 Nanomechanical signatures of oral submucous fibrosis in sub-epithelial connective tissue. J Mech Behav Biomed Mater. 2017 Jan;65:705-715. 4. Chatterjee RP, Gayen S, Kundu S, Chattaraj M, Pal M, Das S. A unique case of clear cell variant of calcifying epithelial odontogenic tumor involving the maxilla. Dent Res J 2017;14:293-6. 8 *Dr. Wasim Nawaz, Dr. Sanchita kundu, Dr.Swagata Gayen, Dr. Rudra Prasad Chatterjee,Dr.Mousumi Pal. Dentigerous cyst associated with adenomatoid odontogenic tumour –A case report. INTERNATIONAL JOURNAL OF CURRENT RESEARCH,Vol 10,Issuue 4,pp 648668-68672,April, 18 . 9 Dr. Debkamal Kar, Dr. Swagata Gayen, Dr. Sanjeet Kumar Das, Dr. Sk.A. Mahmud and Dr. Mousumi Pal 2019. “Transformation of oral squamous cell carcinoma from oral verrucous Leukoplakia - a case report”, INTERNATIONAL JOURNAL OF CURRENT RESEARCH, 10, (07), 71269-71271. 2.Chatterjee RP, Gayen S, Kundu S, Chattaraj M, Pal M, Das S. A unique case of clear cell variant of calcifying epithelial odontogenic tumor involving the maxilla. Dent Res J 2017;14:293-6. 8.1*Dr. Suparna Roy, 2Dr. Rudra Prasad Chatterjee, 3Dr. Sanchita Kundu, 4Dr. Swagata Gayen and 5Dr. Suman Meyur. Primary extra nodal lymphoma: a rare case of gnathic involvement INTERNATIONAL JOURNAL OF CURRENT RESEARCH, Vol 10,Issuue 02,February,2019. 9.*Dr. Somdutta Mitra, Prof. (Dr). Sanchita Kundu, Dr. Rudra Prasad Chatterjee, 4Dr. Swagata Gayen and Dr. Santosh, T. A unique case of aspergillosis involving the maxillary antrum. involvement INTERNATIONAL JOURNAL OF CURRENT RESEARCH, Vol 10,Issuue 02,pp 65538-65541.February,2019,. 10 *Dr. Wasim Nawaz, Dr. Sanchita kundu, Dr.Swagata Gayen, Dr. Rudra Prasad Chatterjee,Dr.Mousumi Pal. Dentigerous cyst associated with adenomatoid odontogenic tumour –A case report. INTERNATIONAL JOURNAL OF CURRENT RESEARCH,Vol 10,Issuue 4,pp 648668-68672,April, 18 . 5 Dr. Debkamal Kar, Dr. Swagata Gayen, Dr. Sanjeet Kumar Das, Dr. Sk.A. Mahmud and Dr. Mousumi Pal 2019. “Transformation of oral squamous cell carcinoma from oral verrucous Leukoplakia - a case report”, INTERNATIONAL JOURNAL OF CURRENT RESEARCH, 10, (07), 71269-71271. 2 Chatterjee RP, Gayen S, Kundu S, Chattaraj M,Pal M, Das S. A unique case of clear cell variant of calcifying epithelial odontogenic tumor involving the maxilla. Dent Res J 2017;14:293-6. 5.1*Dr. Suparna Roy, 2Dr. Rudra Prasad Chatterjee, 3Dr. Sanchita Kundu, 4Dr. Swagata Gayen and 5Dr. Suman Meyur. Primary extra nodal lymphoma: a rare case of gnathic involvement INTERNATIONAL JOURNAL OF CURRENT RESEARCH, Vol 10,Issuue 02,February,2019. 6. Dr. Somdutta Mitra, Prof. (Dr). Sanchita Kundu, Dr. Rudra Prasad Chatterjee, Dr. Swagata Gayen and Dr. Santosh, T. A unique case of aspergillosis involving the maxillary antrum. involvement INTERNATIONAL JOURNAL OF CURRENT RESEARCH, Vol 10,Issuue 02,pp 65538-65541.February,2019,. 7. 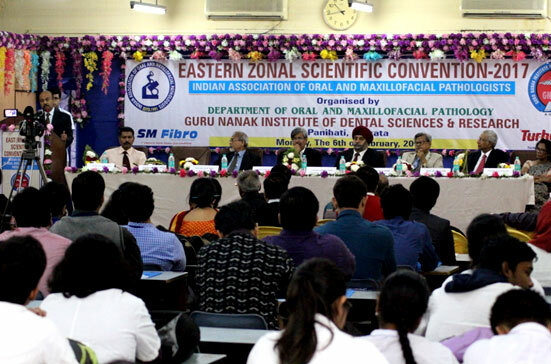 *Dr. Wasim Nawaz, Dr. Sanchita kundu, Dr.Swagata Gayen, Dr. Rudra Prasad Chatterjee,Dr.Mousumi Pal. Dentigerous cyst associated with adenomatoid odontogenic tumour –A case report. INTERNATIONAL JOURNAL OF CURRENT RESEARCH,Vol 10,Issuue 4,pp 648668-68672,April, 18 . 8. Reshmi Sen, Neha Shah, Mahmud Abdul Seikh, Rudra Prasad Chatterjee. Oral condyloma acuminatum in a 75-year-old geriatric patient, BMJ Case Reports 2019; doi:10.1136/bcr-2017-222905. 2. Dr. Somdutta Mitra, Prof. (Dr). Sanchita Kundu, Dr. Rudra Prasad Chatterjee, Dr. Swagata Gayen and Dr. Santosh, T. A unique case of aspergillosis involving the maxillary antrum. involvement INTERNATIONAL JOURNAL OF CURRENT RESEARCH, Vol 10,Issuue 02,pp 65538-65541.February,2019,. 2.Chatterjee RP, Gayen S, Kundu S, Chattaraj M,Pal M, Das S. A unique case of clear cell variant of calcifying epithelial odontogenic tumor involving the maxilla. Dent Res J 2017;14:293-6. 4.1*Dr. Suparna Roy, 2Dr. Rudra Prasad Chatterjee, 3Dr. Sanchita Kundu, 4Dr. Swagata Gayen and 5Dr. Suman Meyur. Primary extra nodal lymphoma: a rare case of gnathic involvement INTERNATIONAL JOURNAL OF CURRENT RESEARCH, Vol 10,Issuue 02,February,2019. 5*Dr. Somdutta Mitra, Prof. (Dr). Sanchita Kundu, Dr. Rudra Prasad Chatterjee, 4Dr. Swagata Gayen and Dr. Santosh, T. A unique case of aspergillosis involving the maxillary antrum. involvement INTERNATIONAL JOURNAL OF CURRENT RESEARCH, Vol 10,Issuue 02,pp 65538-65541.February,2019,. 6 *Dr. Wasim Nawaz, Dr. Sanchita kundu, Dr.Swagata Gayen, Dr. Rudra Prasad Chatterjee,Dr.Mousumi Pal. Dentigerous cyst associated with adenomatoid odontogenic tumour –A case report. INTERNATIONAL JOURNAL OF CURRENT RESEARCH,Vol 10,Issuue 4,pp 648668-68672,April, 18 . 7. Dr. Debkamal Kar, Dr. Swagata Gayen, Dr. Sanjeet Kumar Das, Dr. Sk.A. Mahmud and Dr. Mousumi Pal 2019. “Transformation of oral squamous cell carcinoma from oral verrucous Leukoplakia - a case report”, INTERNATIONAL JOURNAL OF CURRENT RESEARCH, 10, (07), 71269-71271.